Ask fellow campers about "Towns Bluff RV Park and Heritage Center" and nearby attractions. Stayed at this park for 2 nights while traveling thru the area. Sites are gravel with a gravel pad with picnic table and fire ring, spacious, shaded, level and well maintained. Camp host was very helpful and knowledge as well as the office staff. Museum in the Heritage Center office is very informative and interesting with information about the area and wildlife. This park is adjacent to the Altamaha River, which is only a short walk from the campground. Bathrooms are well maintained and clean. Washer and dryer on site. Sites are 30/50 amp with water and electric, dump station near the exit gate. This park is gated and requires a code for entry. We will definitely stay here again when traveling thru the area. We camped at Towns Bluff RV Park and Heritage Center in a Travel Trailer. This park is 6-7 miles from Hazlehurst, GA which has a super Walmart, several fast food/restaurants. Definitely have everything you need if you do not have a tow vehicle. Several small shops in the town. 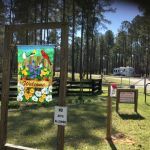 We had a very nice relaxing stay in this shaded campground provided by scrub pines. What was extra special was we had grass, freshly mowed for our dogs to enjoy. There was a patio of sorts made with fine gravel, that the picnic table and fire pit sat on, in addition to the grass. This site was very secluded, with the angle it's on, so if there had been a full campground you'd have not any worries about privacy. Our stay was during the week so the campground was nearly empty. They have a nice museum to explore, and a river close by, but not viewable from any of the camp sites. The reason for our stay was to escape the heat of Florida and wasn't planned, we were on our way north and decided to stop for a few days to check the area out. There isn't much to do for kids, there's a small playground, but not much else. The camp host are awesome people, very helpful with directions and what ever your needs are like delivering ice, or firewood should you need it. We ended up staying for 3 days, exploring the area and visiting some unique shops in the area. If your ever stay here at the Towns Bluff, you have to visit the Blueberry Barn. If you like blueberries, you'll love this place, everything Blueberries !! All in all we liked this campground, clean, bathrooms and showers are well kept, laundry didn't rip you off, it was $1 to wash, 35mins and $1 to dry, 45 mins ! There is only 1 washer and 1 dryer, which could be a small problem if everyone was doing laundry at the same time. The dump station is at the entrance, clean as a dump station can be. We camped at Towns Bluff RV Park and Heritage Center in a Travel Trailer. We stayed overnight in a back-in site with our 40' fifth wheel. There were a number of half-moon shaped pull-thru's available but we opted for the back-in site for our size unit. The camp host was friendly and accommodating to our switching sites from a pull-thru to a back-in. We would definitely stay there again, it looked like a very nice park. We camped at Towns Bluff RV Park and Heritage Center in a Fifth Wheel. Well maintained woodsy camp with small museum and a hiking trail. Pull-through site was level and water/electric hook ups in good condition. It was raining and since there was very little grass or gravel it got messy, but overall a nice place. We would stay there again. We camped at Towns Bluff RV Park and Heritage Center in a Fifth Wheel. Spent 2 nights here, beautiful location on the Altamaha River. The 24 sites are all level and compacted gravel, some pull thru sites. Sites have 30-50 amp elect. and water only. No sewer, cable or WiFi. Our Verizon service was spotty. There is a centrally located bathhouse with hot showers that was very clean. At the check-in station they have a very nice museum concerning local wildlife and the local settlement history, it was well worth seeing. There is nature trails, a boat ramp and beach on the river which is all within a 5 minute or less walk. All & all it is a beautiful campground setting. The only negative was the rough dirt road getting to the campground from the paved highway. I would certainly stay here again. We camped at Towns Bluff RV Park and Heritage Center in a Motorhome. 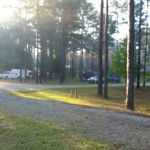 Campground is about 6 miles north of Hazlehurst GA which has some restaurants and shopping. There is a WalMart supercenter in town, but other shopping is pretty limited. Only overnighted at this park. Sign in is at the Heritage Center just past the RV park entrance. It looks like that would be a nice place to spend a little time walking thru. Pull thru sites are 50 amp and back ins are 30 amp. No sewer hookups at the sites. The dump station is at the end of the loop. They must have had a lot of rain shortly before our visit because the mosquitoes were horrendous. Trails are available and I think it would be a nice place to explore. Just make sure you have lots of skeeter repellent. 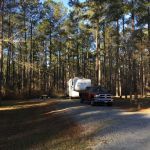 We camped at Towns Bluff RV Park and Heritage Center in a Fifth Wheel. Are you affiliated with Towns Bluff RV Park and Heritage Center ?